Lamination hand roller, no tackyness. Serie HDHR-A-LAM - very robust, heavy duty, full metal handle, for professional use in printing industry, lamination industry, glass industry, etc. Special IIR-elastomer hand roller, free of silicon, for easy lamination of foils onto glass, metal, plastics etc. The HDHR-A-LAM-series is characterised by both sides with ball bearings elastomer rollers on a solid aluminium holder. Due to the both ends ball bearing the rollers run very quiet and generate no dust particles in particular from material abrasion. 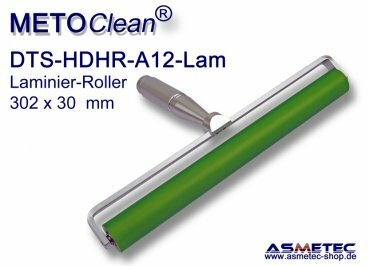 The hand roller METOCLEAN DTS HDHR-A-LAM series are available in widths of 150, 205, 240 and 302 mm. Other roll width upon request.